Monochloroacetic acid (MCA) is one of the most important halogenated derivatives of acetic acid. MCA is a reactive compound that can undergo various reactions to form a number of intermediates. Markets for MCA and derivatives include drilling fluids, plastics stabilizers, herbicides, surfactants, and pharmaceuticals. Production of glycine is the major end use, globally, for MCA. The most significant production of glycine is now in China, where it is an intermediate in the production of glyphosate herbicide. Glyphosate is probably the largest-volume herbicide produced globally. However, there are three common synthetic routes used to manufacture glyphosate and it is only in China where the MCA route is dominant, accounting for 60% of the glyphosate produced in the country. The MCA market will continue to be driven by the Chinese market. China currently accounts for nearly 60% of global MCA consumption and average annual growth of 4% is expected, as relatively strong downstream demand for MCA will continue. The largest market for MCA is the production of carboxymethylcellulose (CMC), which accounts for an estimated 24% of total MCA consumption in 2017, with growth forecast at 3.0% annually during 2017–22. The two leading regions that consume MCA for the production of CMC are Northeast Asia (led by China) and Western Europe. The Middle East (led by Turkey) is the third-largest consuming region. MCA consumption for downstream herbicides is the second-largest application for MCA, at 18% of the total. Downstream products include 2,4-dichlorophenoxyacetic acid (2,4-D), 2-methyl-4-chlorophenoxyacetic acid (MCPA), and other chlorinated herbicides. MCA consumption for 2,4-D/MCPA (herbicides) has increased in recent years. Total MCA demand for this use accounts for 10% of total MCA consumption. India will be the fastest-growing market for this end use. 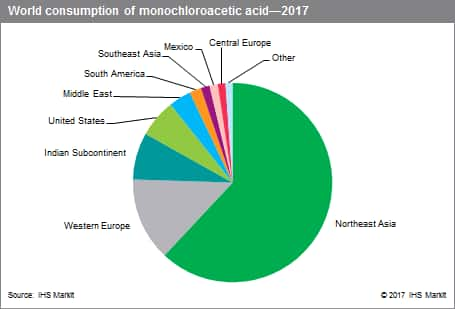 MCA use for glycine production makes up the third-largest market, nearly all of which is consumed in China for the production of glyphosate, accounting for 17% of total MCA consumption. China is the largest global producer and exporter of glyphosate, and around 60% of its glyphosate capacity is glycine- and MCA-based. MCA consumption for glycine is expected to grow at 5.8% annually during 2017–22. China is the largest consumer of MCA, accounting for about 59% of the global total in 2017, and the country continues to increase capacity and demand for the product. Overall MCA consumption in China is expected to grow at 4% per year through the forecast period. Western Europe accounts for about 14% of the total global consumption of MCA in 2017. Western European MCA consumption is expected to grow at 1.4% annually. Nearly half of the MCA consumed in Western Europe is used for CMC production. Other MCA uses in this region include surfactants and herbicides (2,4-D and MPCA); consumption for these markets is expected to show sustained growth over the next five years. The MCA market in India has experienced significant growth in recent years; both domestic capacity and exports have increased in the region. Demand is driven by use in agrochemicals (herbicides) and for the production of ibuprofen. Because lower-quality MCA can be used for ibuprofen manufacture, Indian ibuprofen is very competitive in the global market. MCA consumption is expected to grow at 5.8% annually in India from 2017 to 2022. MCA demand in 2,4-D/MCPA herbicides will continue to be driven by markets in India, China, Western Europe, South America, and the United States. India will continue to be the largest and fastest-growing market in this sector.